Does the combination of custom cars, live music, and sunny Indiana weather sound like a great day for you? Do you love checking out hot rods, low riders, and motorcycles? Then Hendricks County has the perfect event for you, June 13-14. 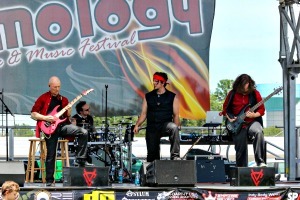 Slamology is a custom car show and music festival. Auto enthusiasts from all over the country descend on Lucas Oil Raceway, 10267 E. U.S. 136, Brownsburg, to show off their cars, enjoy live music and compete for prizes. If you have your own hot rod to show off or even if you&apos;re just a fan, there&apos;s lots to enjoy during this fun-filled weekend. The biggest attraction at Slamology is probably the custom car shows. Hot rods, imports, low riders, mini trucks, motorcycles and more can enter to win cash prizes in a variety of categories. If you&apos;ve tricked out your ride, you&apos;ll want to bring it to Slamology for your chance at cash. If you don&apos;t have a custom car of your own, come out and see all the hard work these owners have put into their automobiles. Slamology is a car show, but it isn&apos;t just a car show. There&apos;s an auto limbo contest, a hydraulics demonstration, a car stereo contest...even a tattoo contest! There&apos;s also a kids play zone for the little ones, and a throwback reunion for those of us that remember the "good old days" of events like Super Chevy Sunday. Slamology has events for every kind of car enthusiast, whether you like new cars or the old classics. The other big draw of Slamology is the music. From Saturday morning until Sunday afternoon, there will be live music in a variety of genres. Metal, rock, electronic, funk, old school...they have it all. The musical offerings at Slamology are as varied as the types of cars, so you&apos;ll definitely find something you can enjoy. The fun of Slamology will be coming to Lucas Oil Raceway June 13 and 14. A one-day adult pass is $10 and a two-day pass is $15. Kids under 10 are free. You can visit the Slamology website to get a free parking pass, otherwise parking is $2. If you&apos;re interested in registering your vehicle, you can find more information here.